The Black Diamond Vapor is an ultralight helmet providing excellent ventilation and a very low profile design. So firstly let’s address the elephant in the room, the price. At £130 the Black Diamond Vapor is really expensive for a climbing helmet, especially when you consider that its main rival, the Petzl Sirocco, retails at £85 at time of writing and is also lighter weight than the Black Diamond helmet. Does £130 buy you a helmet that will last for years? NO. If anything the Vapor is more likely to suffer damage than most conventional climbing helmets. So if it isn’t very durable and isn’t the lightest available then what makes the Black Diamond Vapor Helmet so brilliant…. The Vapor is constructed from a plethora of high tech and very expensive sounding materials; Kevlar, carbon rods, moulded EPS foam and a polycarbonate shell. 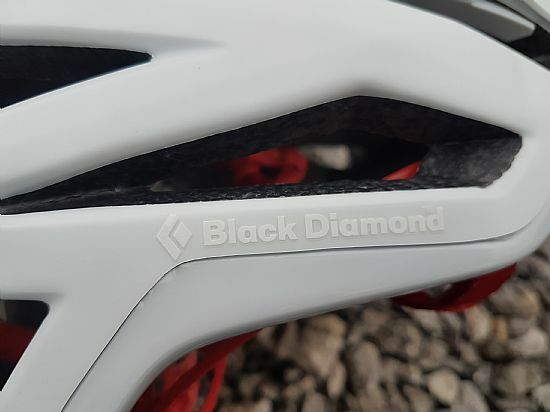 But in essence what these materials really mean is that Black Diamond has been able to construct a helmet which is capable of being used as a rock climbing helmet but is also immensely lightweight, well ventilated and very low profile. Perhaps the first thing that strikes you about the Vapor is just how lightweight it is when you pick it up. Although it may not be the lightest available, you would be hard pushed to complain about the weight. Its lack of weight is, in part, due to the sheer number of holes it has in it. Unlike many other conventional helmets, the majority of the sides and rear of the Vapor helmet are actually just holes intersected by sections of the helmet. As a result of this, the Black Diamond Vapor helmet is amazingly well ventilated. 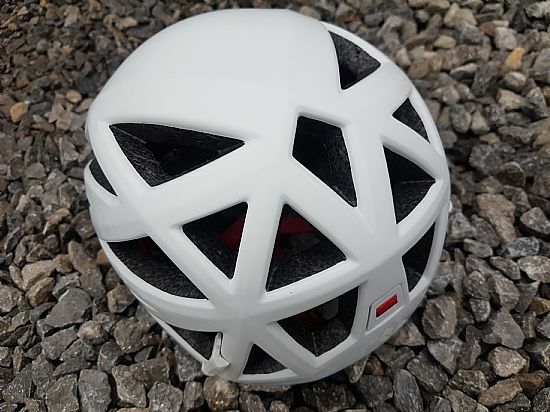 The downside of all this ventilation is that it is very easy for things, such as small pebbles or ice, to land inside your helmet (although it is questionable whether the Vapor would be a good choice for a winter climbing helmet). This has happened on occasions to me (without any serious consequences) as well as things like flies, midges, heather and lichens all landing inside the holes on the helmet. Although this shouldn’t put you off the Black Diamond Vapor, it is worth keeping in mind where you may be climbing with it. The Black Diamond Vapor comes in two sizes; S/M and M/L. Although I opted for the M/L I was quite surprised to find that the S/M did actually fit my head just, so it is definitely worth checking sizing if you are close to either end of the size range (i.e. the top end of the S/M and bottom end of M/L). Adjustment can be made at the rear of the helmet using the ratchet adjuster. 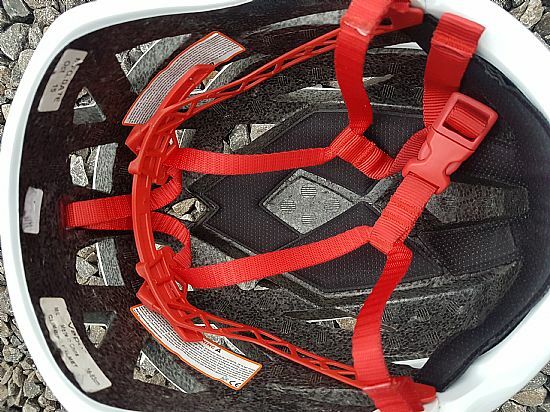 This is a simple but effective system commonly seen on many helmets. It is possible to adjust with gloves on but is by no means easy. Unfortunately this system of adjustment has a habit of getting caught on hoods (or slings occasionally) and subsequently slackening itself. Many other users have reported this and it can be really frustrating; it has happened to me 3 times in one pitch before. This adjustment ratchet can be tucked inside the helmet for storage / transportation, which is a very neat feature. Unfortunately the design of this means that the thin plastic (1mm approximately) sits across the top of your ears, where it is inclined to saw away at the top of your ears. Not so much a problem for a single day climbing but when you wear the helmet day after day you do realise how painful it is. Other users have reported similar issues with the suspension design and it causing headaches as well. 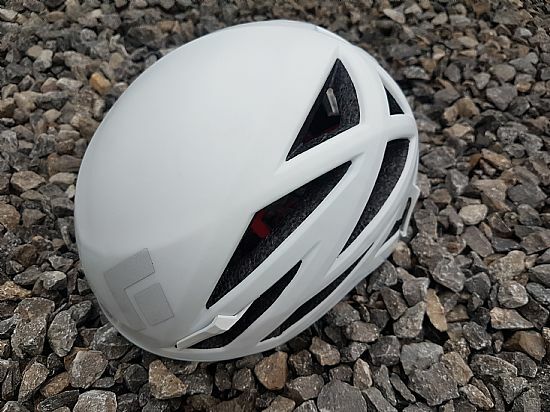 One of the best things about the Black Diamond Vapor helmet and as a result of the construction techniques and materials used (mentioned above) is that it is exceptionally low profile. It sits quite low across your head anyway (just above my eyebrows at the front) but is also quite low volume across the top of your head. 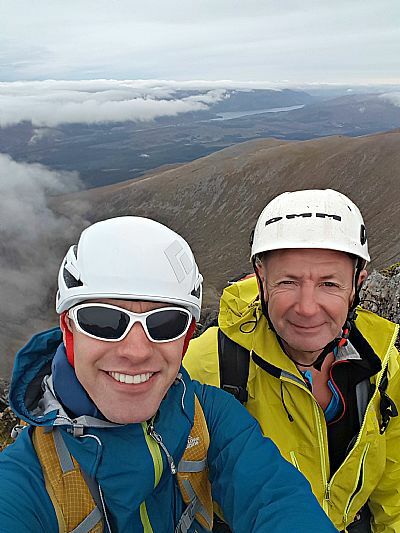 This is not only aesthetically pleasing (you don’t look like you have some kind of massive dome on top of your head) but also means that whilst climbing you are less likely to bump your head or feel that the helmet is in your way (very noticeable and beneficial when climbing up under a roof for example). 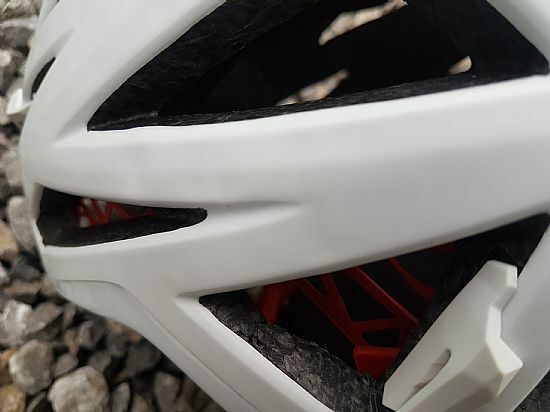 In summary the Black Diamond Vapor is a brilliant helmet; its low profile design, ventilation and lack of weight make it a pleasure to use and barely noticeable that it is there. 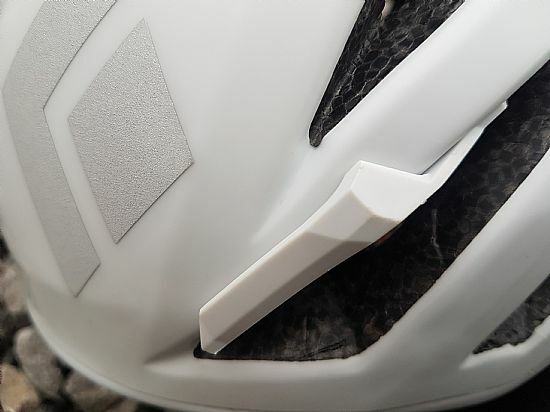 If you are new to EPS foam helmets you may be disappointed that it isn’t very durable (people have broken the helmet just putting it in their rucksack and I managed to dent mine whilst putting the headlamp clips on). It has a couple of minor niggles relating to the adjustment system; loosening off (quite common with this sort of design) and cutting in to your ears (although you may find that it doesn’t do this to you). Low profile design; aesthetically pleasing and great in use (whilst climbing and for fitting a hood over). Lightweight; although not the lightest helmet available, it is extremely lightweight and barely noticeable whilst wearing it. Ventilation; an abundance of ventilation holes means it is perfect for hot weather. Durability or lack thereof. Easy to damage means you have to be careful with it. Ventilation holes provide easy access to stones, ice, flies, midges etc. 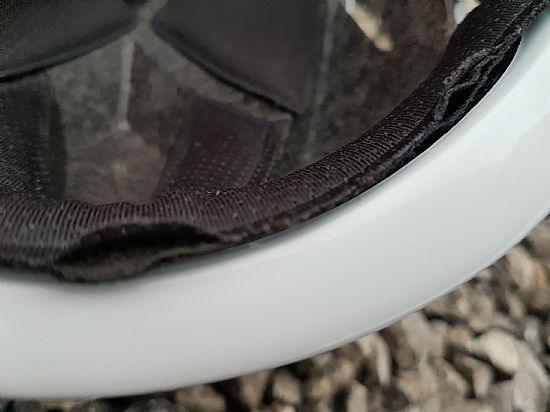 Helmet lining stitching has split apart (see photos below). Ignoring the price for a moment, the Black Diamond Vapor Helmet is arguably the best climbing helmet currently available; brilliantly lightweight, low profile and well ventilated. If you are the sort of person who is reluctant to wear a helmet then you should definitely try the Vapor because it may well win you over. If you are the sort of person who always wears their helmet then you will really appreciate how good the Vapor feels when it’s on your head. With regards to the price, yes it is expensive but personally I feel it is definitely worth it (I did buy this helmet with my own money after all).